Printed with white PLA on my Monoprice Select Mini. After a substantial amount of post-print cleanup of the support material, the threaded parts threaded together easily (it helped when I used beeswax to help glide the path). I ordered a Rosetta JoWo #6, Ruthenium, Broad nib assembly and it too screwed in without problem. 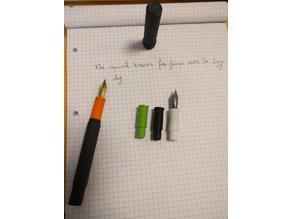 The 3D Printed Fountain Pen Works! The pen is light in the hand, but writes very nicely all things considered. This is great , Thanks for the review! !